Today Labour and the Conservatives locked horns over news that an extra quarter of a million school places will be needed by 2014. After the National Audit Office published a report detailing an increase in capital funding for school places, the Schools Minister David Laws told the BBC that the Government was "reversing completely idiotic policies" followed under Labour that had seen 200,000 school places cut. Tweeting from Labour's education team account @EducationLabour, the opposition party retorted: "David Laws needs to go back to Maths classes if he thinks cutting school places funding by 60% is the Government "sorting out the mess". So who's responsible for the shortfall of school places? Graphed data supplied by the National Audit Office only takes us back as far as 2003/4, so it's tricky to assess Labour's overall legacy on the funding of new school places. However, the spending watchdog notes that the Labour government increased its core capital funding to authorities. With a total of £400 million a year from 2007/08 to 2010/11 "to help cover local growth in need for places". The report adds that this grant was not ringfenced. The graph also shows that capital funding declined in 2010/11 after a number of capital programmes were substantially cut to reflect the 60% real-terms reduction in the DoE's budget. 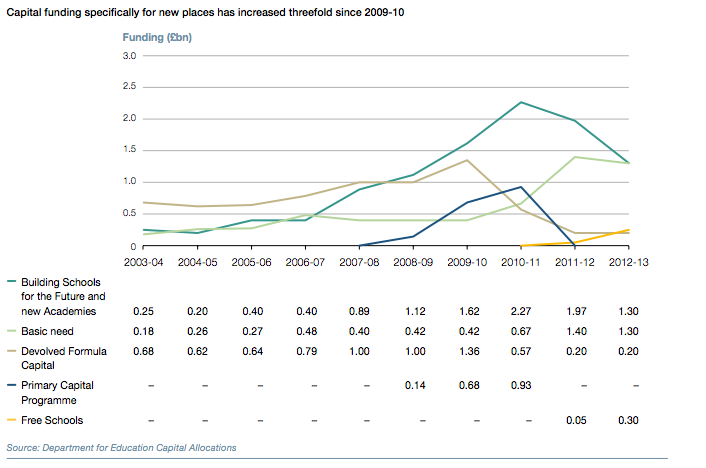 This is the cut that @EducationLabour was referring to, which was announced in the 2010 Spending Review. At the same time, however, core funding for new places increased to £800 million a year from 2011/12 to 2014/15, with a total of £3.2 billion to be paid over the period to local authorities. "This, together with the additional local authority allocations we made in 2011/12 and 2012/13 will bring the total amount of funding allocated to local authorities for new school places over the current spending review period to over £5 billion. This is more than double the £1.9 billion spent by the previous government over an equivalent period." In a sense, both parties are correct. It is however important to point out that in the 1990s the birth rate declined so fewer children started school each year. As we can see, this may be one of the reasons behind Labour's funding gap. A substantial increase in birth rate between 2001 and 2011 is the real guilty party behind this "crisis". What we see in the graph below is the largest increase (+22%) since the 1950s when the number of live births rose by 31%. 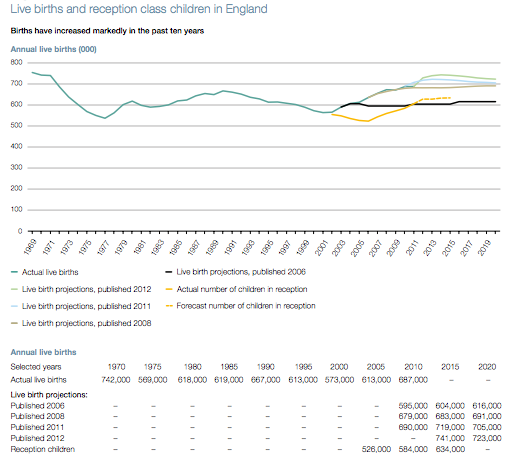 According to the NAO one of the reasons for this is the 6% increase in the number of childbearing women since 2003. But if the birth rate has been rising for a while, why has the crisis exploded now? Data published by the DfE in May 2012 estimated a national surplus of primary school places of 10.4% with 444,410 unfilled places in 2010/11. This can be explained by the fact that over-capacity is concentrated in certain 'hot-spots'. Back in 2010/11, 20.4% of primary schools were full or over capacity. Currently, London accounts for 37% of extra primary school places required, but there are more pressure points in Leeds, Manchester, Cambridge and elsewhere. Is the performance of disadvantaged pupils improving? Are reading standards falling in primary schools? Longer school days, shorter holidays - what's the evidence behind Michael Gove's plans?